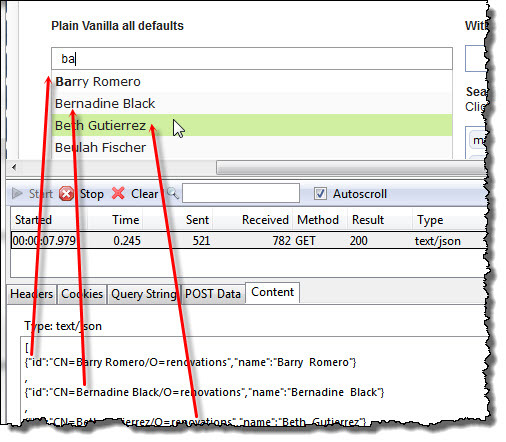 In this article will demonstrate how simple planning and insight can make your XPages EXTLib REST service more efficient. Whatever you are using your REST service for, wither it is to feed charts, grids, other application or whatever it is, they take up data bandwidth and processing time. This batch of data takes up 462 bytes. The first 6 lines the attributes @entryid to @form you have no control over. But you do have controll over the others. 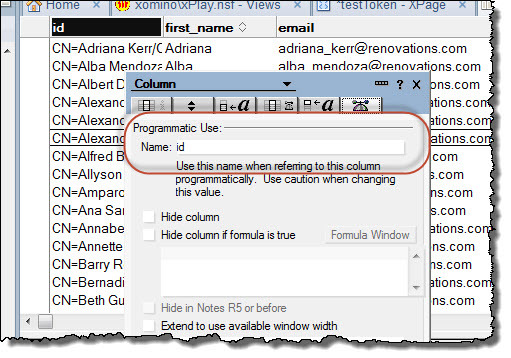 The field name displayed comes from the computed column value in the view. 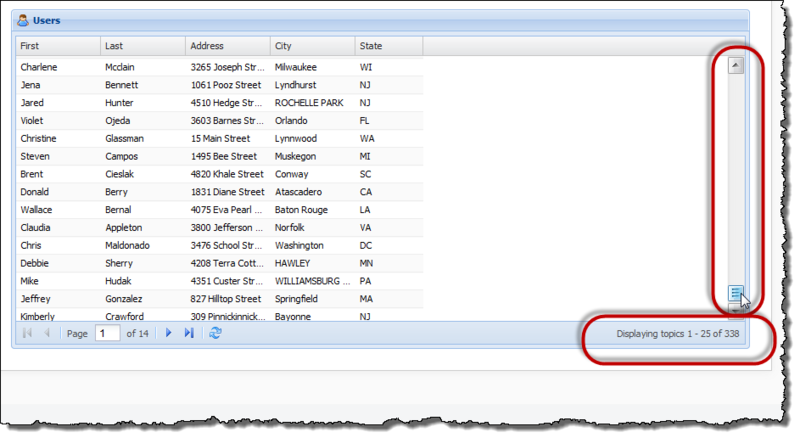 If you have a column which is just a single field the programmatic name will reflect the field Name. And this batch of data takes up 426 bytes (as opposed to 462 before). This right there represents a saving of 8% which might not seem like much but this is only a small view with only a few columns with only short field name. If you scale this up to a large view with 25 columns and large field names that can make 2000 bytes per entry – I just performed a quick test on one of my larger REST services and saved over 25% of the data (which is what inspired me to write the article). “Soooo what” I hear you say – well consider 500 data entries in my world. That ramps up very quickly to a 1M data transfer – saving 25% on that is a significant bandwidth saving – not to mention the reduction in load on your browser having to parse that amount of data. This is especially pertinent in the XPiNC world which I have the unfortunate pleasure of playing with – it is Firefox 3.5 and has memory issues. I have nothing quantifiable to back this up but there is no doubt about it in my mind – a large data volume causes issues in the browser memory management. This is highlighted by a slowdown of the interface – you know the things we USED to have a problem with but don’t any more with Chrome and Firefox browsers. 2) Better control and only send what you need…. This should be common sense but if you are upgrading an existing database and want to take advantage of existing views, might not always be apparent. 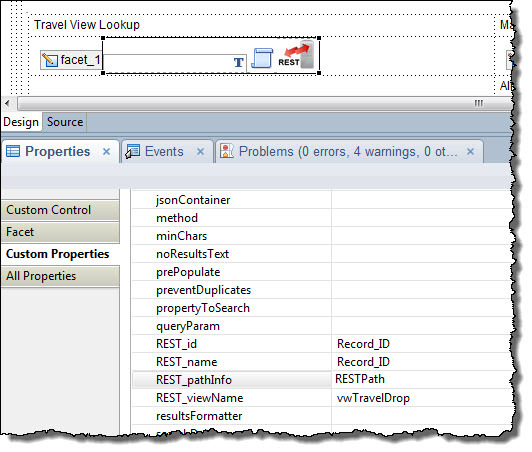 This creates the optimized JSON feed with the smaller field name, without changing it at the column. If the bulk of your data is in the field value and not in the field names you will not see such a large improvement. 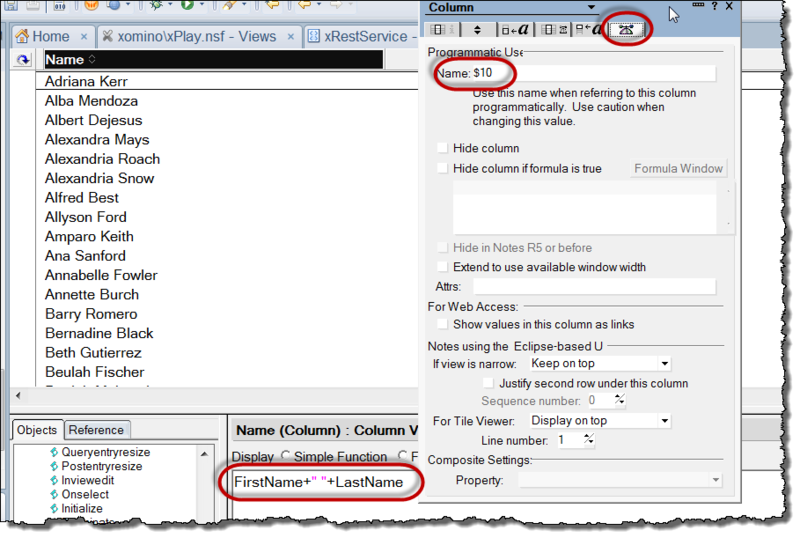 Changing the column names in a view needs to be done carefully as those names could be referenced elsewhere. jQuery in XPages #8 – Tokeninput autocomplete – how does it work? Using the “theme” paramater we are able to determine the style in which the selected “tokens” are displayed to the user. Adding the facebook theme which comes with the plugin we change the way the results are displayed (not the results themselves). As you can see from the provided example we are able to GET (or POST) the JSON data from many sources, I have provided just a few examples, but really the options are only bounded by your needs and imagination. Before I get any grief for not using an XAgent the reason I use this as my first example is that it is probably the easiest to understand and will demonstrate how Tokeninput can generate and manage the search results itself (using it’s own internal ajax calls). By default if you provide a URL (not a JSON object) to Tokeninput it will assume that is the URL to search and it will add “q=” to the end of the provide URL string, and look for the results. This really is as simple as it gets for Tokeninput, not a single parameter, all assumed default values. custom1 is the name of our text field and peopleLookup is our notes agent. and this is how it breaks down…..
count=10 determines the number of results returned. We can provide a “key” to the REST service which acts likes a getDocumentByKey. The key then extract the “ma” from the Query_String and provides the first document matching “ma” and then 10 documents after that. These become the displayed results from Tokeninput. A picture of the results was shown above in the initial discussion. I have working proof of concept for this but I do not like the solution so it is really hard for me to write about it. With so many “better” ways to get the data from a notes view this is not something I recommend. If anyone is interested please contact me directly (@MarkyRoden) and we can discuss. And this to me with where Tokeninput takes the typeahead autocomplete to the next level…..
so what happens when this is submitted? If you remember the default submitted value in the Tokeninput is “id”….and If you look at the feed there is an id tag for every tweet…..
and when we submit the value back to the database we get a multivalue field containing all the tweet ids. If you want to change the field stored use the “tokenValue” parameter. 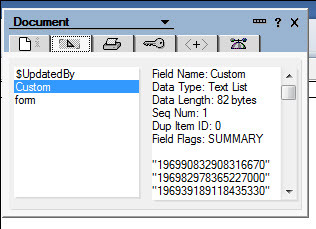 The Tokeninput field is mapped to the “Custom” field in the XPage through the data source. The possibilities with Tokeninput are only limited by the developers imagination and the data source available. I have demonstrated how we can create our own JSON Feed using a REST feed, how to create a simple JSON feed using a notesagent, how to parse an existing notes view readviewentries JSON feed and how to parse an external feed (twitter) and display some fantastic result results while maintaining data control. 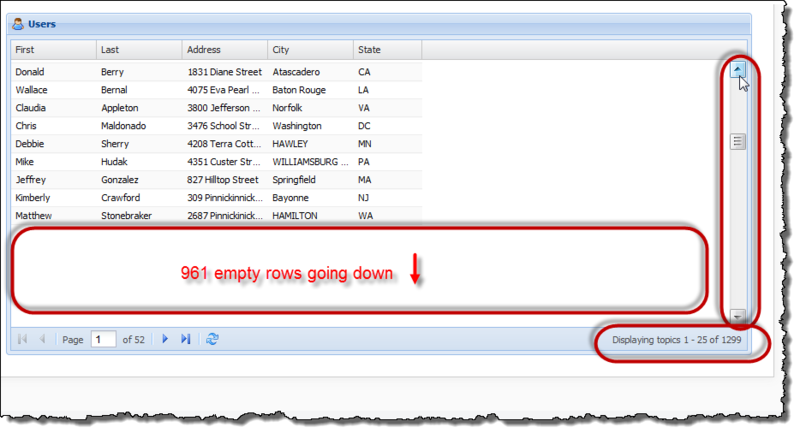 In my opinion (from a user experience) this trumps the XPages typeAhead field capability hands down . This also trumps the XPages typeAhead from a developer perspective as well because it will take data from sources other than an internal notes view and will return multiple values which the current type ahead will not. 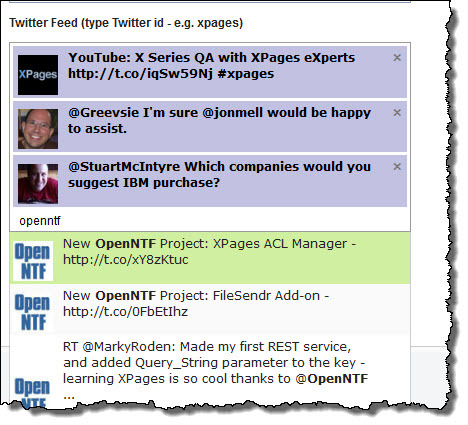 To be submitted to OpenNTF – I am working on a custom control to add a dynamic Tokeninput field to any XPage. It will provide a direct alternative to the dojo typeAhead and provide greater flexibility for users.